It’s no secret…I got myself a Clearlight Infrared Sauna! And clearly, I’m bloody stoked with it! are the benefits? What makes it different to other types of heat therapy? There is so much information out there about Infrared Saunas that I could go on for days, weeks even. But instead, I’m going to focus on the most important questions and leave it to the expert to explain the finer details. After all, there is a lot on the world wide web about Infrared Saunas, that there is no point in me regurgitating it for you! An infrared sauna is a different type of heat, it builds gradually, heating the body rather than the air around you. Which means I last longer and get more out of a session compared to a traditional sauna. Its relaxing, calm, quiet and provides me with a space to enjoy the outdoors without all the noise and distractions of – dare I say it – humans. Not surprisingly, a few infrared saunas a week, does wonders for my mental health by reducing stress levels in the body. I love to sweat! Using the infrared sauna means I get a longer, deeper penetration of heat, so I sweat much more than I would if I sat in a steam sauna or regular sauna, aiding in detoxification. Longer, deeper penetration of heat is also brilliant for muscle and joint recovery. My skin loves it! I have good skin naturally, but as I’ve gotten older, my cell turnover is much slower. The heat, plus a light scrub afterwards does wonders! Colour therapy! I was new to this and now I love it. It’s amazing how different colours affect your moods in different ways – invigorating to totally soothing. The Clearlight Sauna design was so easily integrated into our home and was super easy to assemble. It’s the 21st We all know about Bluetooth and man is it handy when you want to zone out with meditation music OR watch a cheeky movie. Low EMF is a must and these babies have it! Clearlight Saunas was the company that pioneered low EMF carbon heaters in the infrared sauna industry. The maximum threshold is 3mg and they guarantee their levels well below. More info below. Cost to run a frickin LOW! If you ran your sauna for an hour every day, you’d spend less than $5 a week on extra juice! They are cost affective! 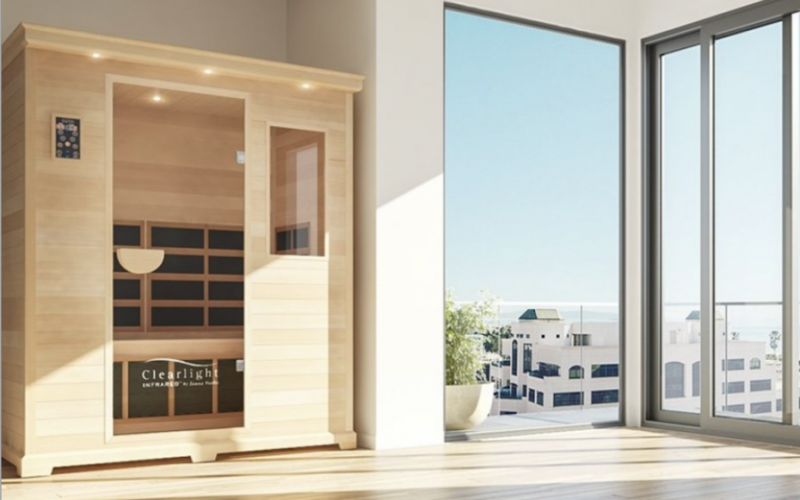 If you want a good Infrared Sauna, you need to see it as investing in your health. BUT, you don’t have to blow the bank. 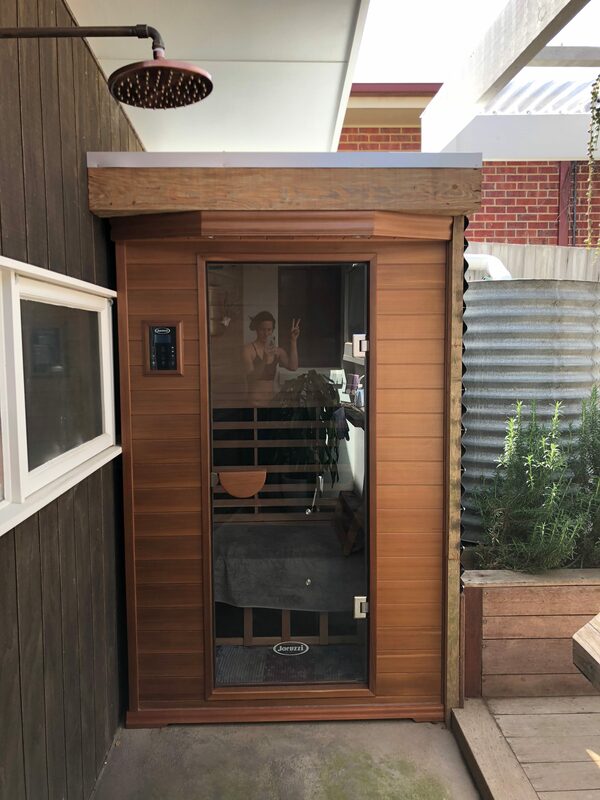 Myself and my husband saw our Clearlight 2 seater Cedar Wood Premier model sauna for $7000AUD, as a clear investment! See the maths below. It costs $3500AUD for our sauna per person. It costs roughly $45 to use an infrared sauna at a third-party venue for 45 minutes for 1 person. It would take my husband and I only 31 weeks to pay it off! That’s less than 7 months! Already sold? You can use the code BANTAM100 to purchaser your Infrared Sauna with $100 off, CLICK HERE! IS HEAT THERAPY FOR YOU? Heat therapy isn’t for everyone. Just like cold therapy isn’t for everyone. Someone said to me not long ago, “why don’t you get an ice bath! You have to get an ice bath! It’s so good for you!” My response…HELL NO! My body does not respond well to the cold! I seize up, become achy and sore, get sick and the chances of injuring myself become much higher. I also find it extremely uncomfortable and the antithesis of relaxing! My body does not respond well to stress, so why add to it? As my Chinese Medicine practitioner says, “You need heat in the body to flow.” Bless her! That’s why an infrared sauna works for me and I love it. If you haven’t tried it before I definitely recommend giving it a go. You can also cash in on a free session by contacting the team at Clearlight Sauna’s Australia. 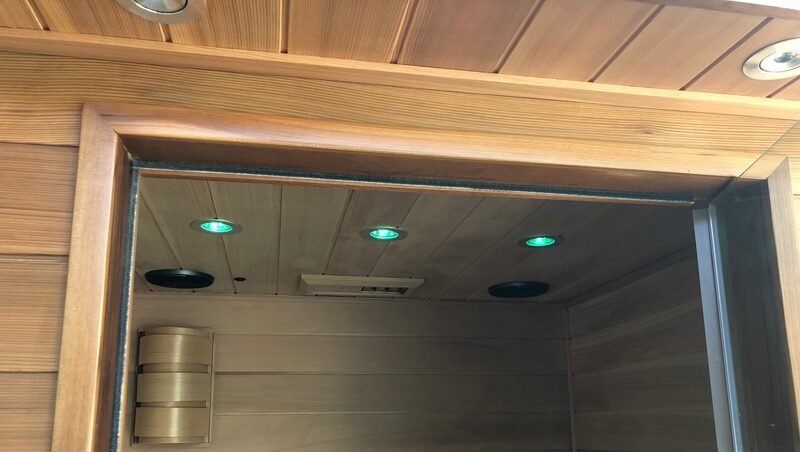 I’m a simple human, who likes simple pleasures and generally measures a products worth by the way it makes me feel and my Clearlight Infrared Sauna makes me feel gooooood!